After we had lunch outside I heard a hawk come down and everybody scatter. Squirrels raging, birds with alarm calls and the doves with their usual heavy wing beats getting off the ground. I wondered what it had taken since it flew right up into the trees at the edge of our property. I wanted to know ... and I didn't want to know, but I went with my camera since it was right by me. There was enough of a spot in the canopy where it sat to be able to get some photos, and I even took a video. Fortunately I shoot through the eye piece and not the screen. I've just never made that change when I went to digital. View more hawk photos in the gallery album. I really couldn't "see" what I was photographing or maybe my mind just blocked seeing. I kept wondering what it was as he ate away with his eye watching me ... and me watching him grieving for whatever life was sacrificed to provide nourishment to this hawk. 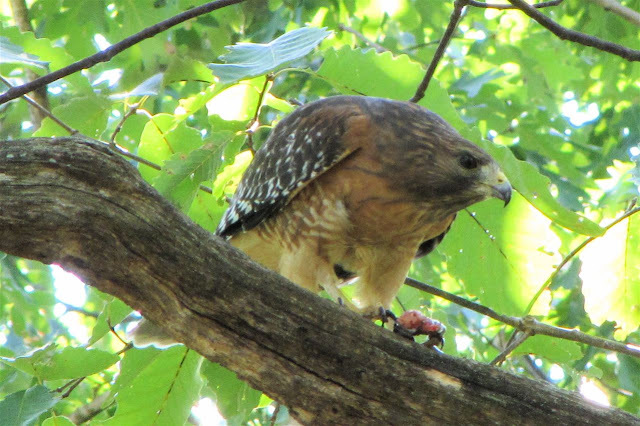 Red-shouldered hawks have nested in our backyard (behind our property) for the past 3 years and I do hear them from time to time ... and I know they're dining in the area, of course. With the fox that is continually seen and the hawks, I've not seen a bunny in quite awhile. And our squirrels have been well managed as to the population. All part of nature for now on this earth ... but some of it sure isn't pretty. In an effort to find something positive in every situation, I guess that's one less frog to eat the tadpoles I released and were concerned about. It seems everything works itself out in the end ... if we trust and have enough patience to stay tuned in to see the good of it all. View the video.